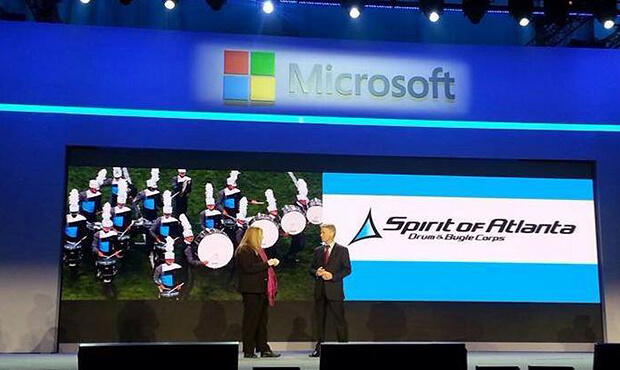 Board president Annette Love introduces Spirit of Atlanta's drum line at the 2014 Microsoft Convergence Convention in Atlanta. A Spirit of Atlanta drum line took center stage this week as part of the 2014 Microsoft Convergence Convention in downtown Atlanta. Attracting more than 10,000 attendees, the convention held March 4-7 served as an educational and networking expo for Microsoft customers. Keynote speakers at this year's event included Twitter co-founder Biz Stone and media mogul Arianna Huffington. Microsoft regularly features a nonprofit organization to entertain as part of the annual convention. Annette Love, president of the Spirit of Atlanta board of directors, says she was contacted out of the blue to organize an ensemble. "It's one of those things that when Microsoft calls and asks if you'll perform, it's hard not to say, 'Oh yes, we'll do it!'" Love said. Members of Spirit's newly formed local ensemble for Drum Corps International's growing DrumLine Battle program served as the performers. The group had the opportunity to drum in and around the convention center before kicking off an opening address by Kirill Tatarinov, executive vice president of the Microsoft Business Solutions Group. "The experience for our kids was overwhelming to begin with," Love said. "But I don't think I realized how big this was until they flashed Spirit's logo on the screen under one of the biggest brands of the world." Love says that the performance served as a fundraiser for the corps, which will receive $1 for every post-conference evaluation submitted by attendees. Even more important, however, she says it put the organization under a spotlight in its local community. "Part of our reason for participating in this event was to get Spirit of Atlanta out there and to connect with the city. We've already been asked to play at several events since."